Do you own or work for a Bristol based company? Would you like increase exposure within your area and have a charity link? Would you like to help your local animals in need? You’ve got the event for you! 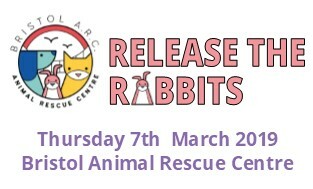 On Thursday 7 March you could be part of something very special - our very first Release the Rabbits! In a jail and bail style event, you will have the day to raise £400 and be released from your 'hutch'. Enough money to look after one of our rabbits for nearly a month! You'll have your phone, computer and access to WiFi - giving you all of the tools you need to raise the funds.